J: We had been trying for years to find ways to collaborate, but what ideas we had were either rehashes of already tried concepts such as collages combining text with visual images or (really bad) pastiche. Then we came across Rick Moody’s short story “Pan’s Fair Throng,” which served as the catalog for Elena Sisto’s 1999 show “Fairy Tales” at the Maier Museum. 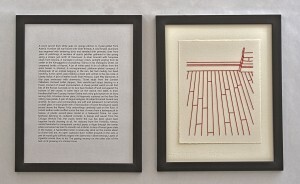 Sisto’s paintings and Moody’s story supported and elaborated each other as equal partners in an effort in which, though the work of each artist could certainly stand on its own, their synthesis articulated a stronger version of the fantastic, while at the same time inviting questions as to the nature and ongoing appeal of the fairy tale. Might we try something similar? Independently, we had both been working toward a kind of minimalist expression. 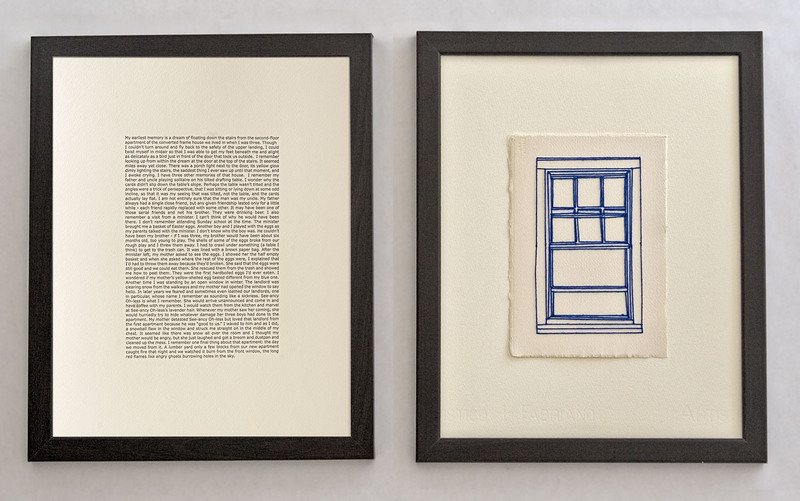 J had been working on a series of drawings rendered in thread in which various architectural icons such as windows, doorways, and stairwells found themselves devoid of inhabitants. Jim had been working toward a fiction of anonymity in which the characters in his stories remained nameless and in which the action was suggested rather than expressly narrated. 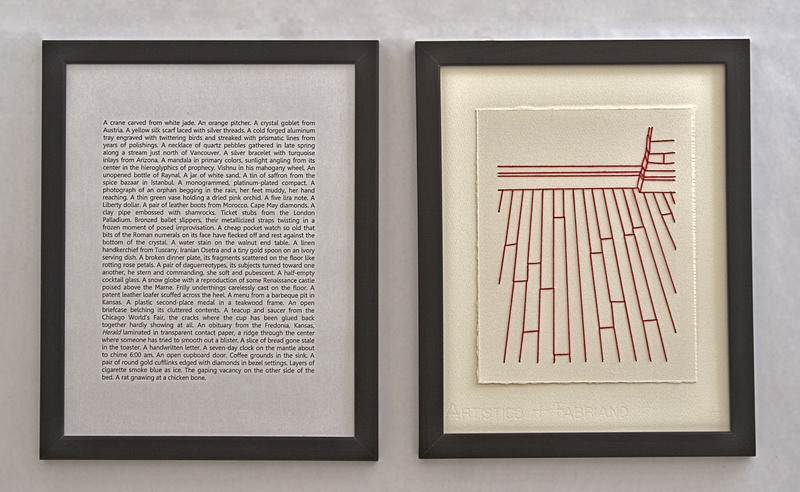 In effect, both series invited the view/reader to complete the work. We began pairing individual pieces to see what the affect of their being set against or in collaboration with each other would be. What we learned was that in viewing a given pair, one’s attention fluctuated back and forth between the two components, as if the drawings were rejecting the stories as captions and the stories rejecting the drawings as illustrations. Then we found out about Everything is Index and realized that what we had done was create pairings in which each half was indexing the other. Q: What is your creative background? How have you arrived at your current medium? J: At the conclusion of my formal training as a painter, I began embroidering on top of figural paintings, in effect erasing the figures with thread. Over time, I realized that this embroidery process was a way of simplifying the paintings into their essential elements in an effort to depict the universal experience of living in a body. Eventually, I found the most effective way for me to express the feeling of being in a body was to omit the image of the body from the work altogether, including only the environments in which the body exists. Consequently, I abandoned painting, leaving only the embroidery that was originally used in conjunction with paint. The effect is that the viewer projects his own physical experience into the work, finishing the story. Jim: I originally wrote really bad poetry, eventually deciding that a machine could do better and developed a software program to write my poetry for me. That project eventually culminated in Issue 1, an anthology of computer-generated texts that I developed with Steve McLaughlin. By then I’d exhausted the possibilities for computationally generated aesthetic texts and returned to writing my own, this time working in narrative, which has turned out to be a more natural form for me than poetry. Q: Has the recession impacted your art? J: It seemed that the recession hit the hardest just as I was beginning to make art full time. At this critical point in the development of my work, I chose to employ affordable materials, most notably thread and paper, due to limited earnings. This limitation forced me to move in an entirely different direction than the one in which I had been moving as a painter. The change was so revolutionary to my work that I continue to change my primary medium yearly in an effort to enliven the work. Jim: A direct result of the recession has been a reduction in funding for academic and independent literary journals, the mainstays of emerging writers. Many have folded, reducing the available publication space. Writers have to be much more persistent and resourceful in getting editors’ attention and they simply have to be better writers. With competition for available space very high, editors can be much more selective about what they publish than they have in the past. Another result of the recession is that many journals have abandoned their print presence and gone solely online. Writing for an online audience requires a subtle shift in emphasis. You have less time to capture the reader. Online fiction is all about the opening, where print fiction allows more attention to overall process. Q: In your experience, do hard economic times hurt or help art? A: Hard economic times hurt everyone. Q: What do you want the audience to take away from your work? What do you take away from it? A: We hope our audience leaves feeling as if they have contributed to the work as much as we. As anonymous, uninhabited landscapes, Our Ekphrastic Inversions are incomplete until a viewer populates them. What do we take away? That collaboration is really, really hard.